Decadent and delicious, you'll savour every bite of this pudding and chocolate cream. 1. Pour 1 and one half cups of the milk into a medium saucepan and add sugar, cocoa, chocolate, vanilla and salt. Bring to a simmer and whisk until chocolate has melted and it's smooth. 2. Meanwhile whisk the cornstarch into the remaining milk until it has dissolved. Slowly pour the cornstarch mixture into the chocolate mixture whisking well. Continue cooking over low heat, stirring constantly until the pudding has thickened. Pour into your choice of parfait glasses, ramekins or small bowls and refrigerate until set, about an hour. Serve topped with White Chocolate Whipped Cream. 1. Heat cream and white chocolate together in a small saucepan, just until chocolate has melted. Whisk smooth. Pour into a medium bowl and place in refrigerator until well chilled. 2. 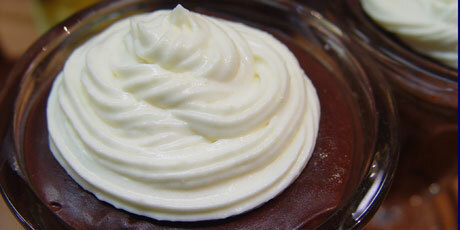 Once cooled whip into soft peaks and dollop onto chocolate pudding or your favourite dessert!